Bright golden yellow color. The nose offers floral and stony mineral aromas. Rich and elegant on the palate with citrus and lemon flavors, and a nice acidity. Domaine Michel Delorme was founded in 1820 and is located in Vergisson, a very small traditionally winegrowing village in South Burgundy, 10 km from Mâcon and famous for its “Roche” (rock). Delorme family has owned the Domaine for generations. The origin can be traced back to the 17th century. The vineyard is composed of 4.3 hectares (10.6 acres) of land. The breakdown is 3.9 hectares of Pouilly-Fuisse and 0.4 hectare of Saint-Veran. Approximately 60% of his production is sold in bottle and 40% sold in bulk to negoce. Production is about 2,400 bottles of Saint-Veran (200 cases) and 16,000 bottles of Pouilly-Fuisse (1,333 cases). The vineyards are cultivated on slopes around the Rock of Vergisson, with a south-southeast exposure. 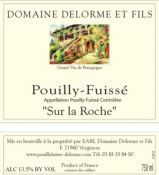 Pouilly-Fuisse and Saint-Veran wines are both 100 % made from the little golden-seeded Chardonnay grape.